As their popularity grew throughout the 1980s, U2 became more and more restless. Despite taking over the airwaves and large outdoor stadiums, the band resisted the urge to become formulaic, instead challenging themselves with each new release. During the 1990s, U2 tried harder than ever to break away from their signature sound by pushing the boundaries of their music even further, layering sonic experiments over churning dance grooves. Many folks are heralding U2's tenth album All That You Can't Leave Behind as a sort of homecoming for the band, and, in part, I suppose it is. The gospel styles that pervaded their '80s releases once again resound through their music. But, All That You Can't Leave Behind is simply the next stage in the band's evolution. On Achtung Baby, Zooropa, and Pop, as well as the band's subsequent tours, U2 firmly entrenched themselves in the war against mass consumption and media overload, attacking the consumer-driven culture that had given them birth. These themes also resonate through All That You Can't Leave Behind, though each track cleverly mixes the band's subversive rants amidst songs of love. On the opening Beautiful Day, Bono sings, "What you don't have/You don't need it now," and he echoes this sentiment on Stuck in a Moment You Can't Get Out Of. Yet, U2 also attempts to guide their listeners towards changing their lifestyles. The band concluded Zooropa with a song titled The Wanderer — a post-apocalyptic tale of a man seeking sensation and experience. This was a reflection of what U2 felt — that mankind was lost in its worship of all things material. Unlike Zooropa and Pop, however, All That You Can't Leave Behind is a warmer album — as if the members of U2 have found their calling and come to terms with it. Rather than being a part of the coldness of product packaging, they bathe their new songs in a sunny glow. Much like a preacher, Bono urges, "You've got to leave it behind/All that you fashion/All that you make/All that you build/All that you break," to conclude Walk On, while Kite questions the quality of life in the face of mortality by asking, "Did I waste it?/Not so much I couldn't taste it/Life should be fragrant." 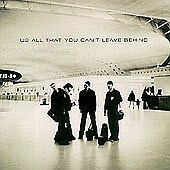 All That You Can't Leave Behind is also a step forward for U2 musically as they draw from a varied array of influences. The band had performed Lou Reed's Satellite of Love during their tour for Achtung Baby, and though they've been influenced by him throughout their career, it's never shown quite so much as it does on New York. The Beatles and John Lennon also continue to play a huge role in U2's music, and Bono has tapped into Lennon's spirit in his fight for humanistic causes such as the dismissal of Third World debt. In addition, shades of gospel and R&B color each of the new selections. What's even more interesting, however, is how U2 has once again tapped into the current pop music scene to create something new. With such a lengthy and storied career, it was only a matter of time until U2 would spawn the next generation of bands, and these newcomers have sprung forth over the past few years. Travis, Radiohead, Moby, and the New Radicals (to name a few) have each pulled from U2's arsenal in creating their own style. After hearing what each of these artists has done, U2 in turn uses this as the underlying inspiration for All That You Can't Leave Behind — incorporating the characteristics of each of these bands into their songs. Peace on Earth is virtually a sequel to Travis' Turn, and the inspirational grooves and techno synths of Moby's Play float above every note that U2 delivers. Some bands find that as their careers lengthen, they become more and more insulated from the outside world. As a result, their albums and songs all start to sound like different variations on the same theme. U2 has managed to defy this by keeping their ears and minds open to other artists. On All That You Can't Leave Behind, all of the band's restlessness and constant searching has paid off with big rewards. It's simply the best album they've created, perfecting all that has come before it without sounding old in the process. Instead, the members of U2 sound as if they are just getting started. All That You Can't Leave Behind is available from Barnes & Noble.